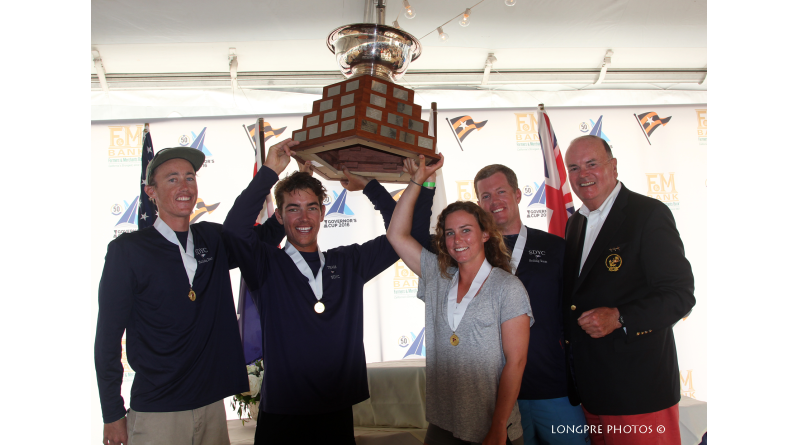 The San Diego Yacht Club team with the Gov Cup. NEWPORT BEACH — After four years of Australian winners, Nevin Snow and his team from San Diego Yacht Club defeated Sam Gilmour and his team from Royal Freshwater Bay Yacht Club claiming the 50th Governor’s Cup during the heated competition, July 23 at Balboa Yacht Club. This marks Snow’s second time winning the cup. He won in 2011, while Gilmour was first in 2013 and 2014. To get to the finals, there was a battle of the Australians between Gilmour and last year’s winner, Harry Price, from Cruising Yacht Club of Australia. Gilmour was able to win two out of three races to move on to the finals. Snow had raced Christophe Killian’s team from the host club, winning both races. Killian took third for the third time in three years. Ryo Takahashi from Japan Youth Match Racing Association defeated Chris Weis from Del Rey Yacht Club to place fifth. William Dargeville from Royal Prince Alfred Yacht Club defeated Lachy Gilmore from Royal Freshwater Bay YC to place seventh. George Anyon, in ninth, from Royal New Zealand Yacht Squadron defeated Charles LaLumiere from Portland Yacht Club. For 11th, Romain Screve of San Francisco Yacht Club won two out of three races to defeat Will Boulden of Royal Freshwater Bay YC. After racing, the winning boats were greeted by a cheering crowd at Balboa YC. Trophies were awarded to the second, third and fourth place teams. In addition, the team from Royal Prince Alfred YC was awarded the Sportsmanship Award, a special honor which is voted on by the team members and umpires. More information is available at govcupracing.com.